Since 1990, a stunning collection of more than 30 Colonial Revival, Queen Anne, Romanesque, Victorian, and Italianate homes built in Erie between 1857 and 1939 has been listed on the National Register of Historic Places as "The West 21st Street Historic District." Today, the district – which spans 125 to 262 West 21st Street and 2014 to 2125 Sassafras Street – is diminished, as it's oldest, grandest structure, the Heman Janes Mansion at 125 W. 21st St. was recently demolished by The Villiage at Luther Square, which is an assisted living facility for the elderly. But when it stood from 1857 to 2014, it stood as an incredible example of classic Italianate style. Set back 20 feet from the street on an expansive corner lot, it featured exquisite Victorian tracery, an octagonal cupola, a domed roof, and dozens of other extravagant features often found in such elaborate estates. Today, it's gone – a ghost of Erie past. Save for a recently released music video – and a brick. In case you haven't already seen it, The Lower Eastside Connection recorded the music video to "Oubliette" (shot and directed by Jessica Yochim) in the historic home – the place where guitarist Dan Head was living before it was razed. But the conversation in Erie the house and its demolishing epitomizes – one that goes something along the lines of what more can we be doing to keep from tearing down our past if we're only looking to fill our future with parking lots – isn't something new. 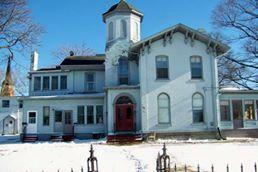 Civitas and Preservation Erie member Lisa Austin wrote about the Heman Janes Mansion back in May. Erie Reader Editor-at-Large Cory Vaillancourt followed up that conversation with an idea – one modeled after the Historic Savannah Foundation was founded in Savannah, Ga.
An idea that was born from a solitary blue brick – one from the walls of the Heman Janes Mansion, and one with which he proposed a building of Erie's future. Although I didn't see anyone in The LEC video holding bricks at the end, I did see an opportunity to further this conversation. On the latest installment of Weekend All Things Erie, I invited LEC's Jonny Evans and Dan Head, filmmaker Jessica Yochim, Lisa Austin, and Cory Vaillancourt to the studio to talk about "The Art of Preservation" – which you can listen to online here. Ben Speggen cares about both music and preservation and when the two are married, that makes for a great production. He can be contacted for print-related things at bSpeggen@ErieReader.com, or if you want to chat radio-related items, drop him a line at Ben@WQLN.org. You can tweet with him using @ERBenSpeggen and for Weekend All Things Erie-related thoughts, suggestions, and comments, use #AllThingsErie.